I apologize to everyone for not getting this post up last week. I know how hard it is to find information like this anywhere else on the internet, so it must have made for an unpleasant Sunday. I'll try not to let it happen again. This weekend, the total numbers were up, with a few new releases performing quite well. "The Croods" grabbed the top overall spot (not to anyone's surprise), while "Olympus Has Fallen", which was maybe the biggest surprise this weekend, comfortably settled into the second spot. 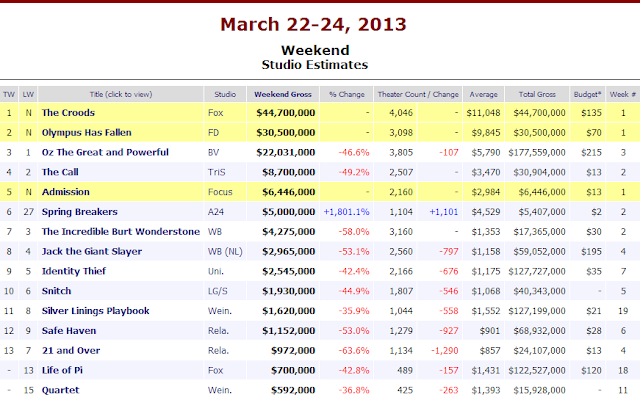 The now three-week old "Oz the Great and Powerful" also continued to shine, claiming third place. The drop-off after the top three was significant, but the top films of the weekend still managed the highest overall gross of any weekend so far in March. Hit the jump for a full rundown on this weekend's numbers! 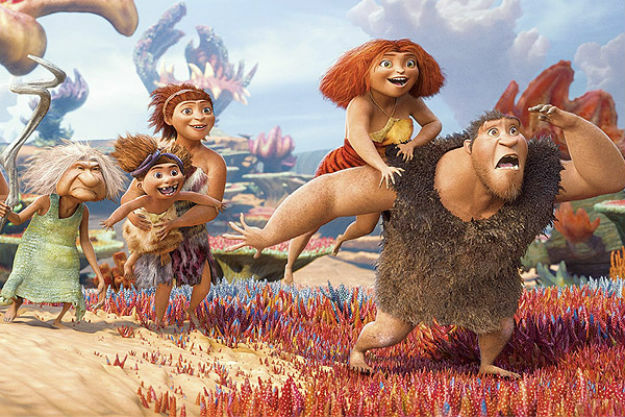 We'll start with "The Croods", as it took first place with $44.7MM this weekend. As I said, I'm not surprised at all that this film grabbed the top spot, and this total was even right in the area I expected. Nothing incredibly exciting or unprecedented, but a strong opening weekend nonetheless. This DreamWorks animated feature sports a budget of $135MM. This is almost exactly in line with where DreamWorks likes to budget their top-tier animated films, and rarely do they under-perform. That being said, if you look at some of the opening totals for other DreamWorks animated films, you can see some vast differences between what "The Croods" brought in and what some other films have opened with. It's not incredibly promising to see a film like "Megamind" open with a higher amount, but on the other side, "How to Train Your Dragon" opened with a bit less, and this feels like a pretty comparable film in theme - and "How to Train Your Dragon" went on to be the highest-grossing DreamWorks animated film that doesn't have Shrek in its title. "The Croods" also did open with another $62MM internationally this weekend, bringing its worldwide total up to $107MM in its first weekend. The film received generally favorable reviews, so I have no worries that this will end up being a successful venture. In second this week was "Olympus Has Fallen". The film opened with a total of $30.5MM. This was one of the more surprising totals I've seen for a while. I expected that the film would perform decently, but I don't think I would have guessed it to hit the $30MM mark. The film has received mixed reviews from critics, but for an action film, sometimes that's good enough. 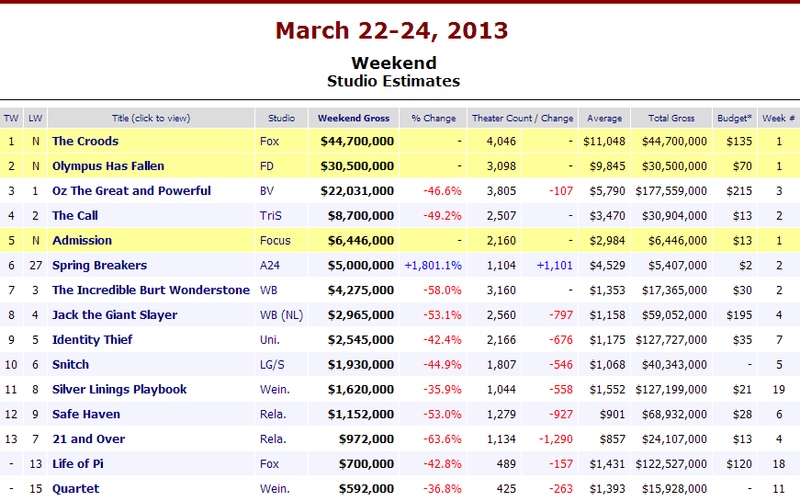 The cast is strong, and after this weekend, that $70MM budget doesn't seem quite so intimidating. Assuming word of mouth stays generally positive for the film, I can't see any way this film doesn't surpass its budget. I'm glad to see a pure action movie do well again - I may now need to head to the theater and check this one out. By the way, this ranks as the third-best opening ever amongst President Movies, and second-best ever amongst Hostage Movies. "Air Force One" slipped ahead of it on both lists. In third place this week, now in its third week, was "Oz the Great and Powerful". The film made $22MM this weekend, bringing its domestic totals up to $177MM. Adding to that its international totals of $178MM, the film is now already over $350MM worldwide. I think I always knew this would perform well overseas, but for some reason I continue to be amazed by how well it's doing domestically. I still have not seen the film yet, but per the previews, it just never looked like the film for me. I must just be in the minority on that one. Anyway, with a budget of $215MM, it should be able to surpass that on both the domestic and international side. I won't be surprised if in a few weeks this one is already over the $500MM mark worldwide. Fourth place this weekend saw "The Call", now in its second weekend, add $8.7MM more to its total, bringing its domestic gross up to $30MM. There are no international totals for this film, but with only a $13MM budget, this one has already more than doubled that. I suppose this is already a bit more than I expected from this thriller that didn't review particularly well, but $30MM in two weeks isn't the craziest thing. We're not going to see any notable records with this film, but it's out-performed its budget, and that's ultimately all that matters. In fifth place was the third new release this weekend, "Admission". As expected, this one did not do so hot. It made only $6.4MM this weekend, well short of its minimal $13MM budget. As much as I like Tina Fey and Paul Rudd, the trailers never did it for me with this one - and critics seemed to agree. In films opening in at least 2,000 theaters, this was the worst opening ever for both Paul Rudd and Tina Fey. I think and hope this can make its budget back, but the fact that a $13MM budget isn't a gimme is concerning. Hopefully the next work we see out of either of these two will be a bit more inspiring. Outside of the Top 5 I don't really see anything of note. Nothing hit any big numbers this week outside of "Life of Pi" (though this could have happened last weekend), which finally surpassed its $120MM budget domestically. It now has made $122MM in America, but has a total of more than $600MM worldwide.